The scene is a theater stage in one of England’s booming industrial cities of the 1840s. The entertainment is a minstrel show, a raucous delineation of some culture and much caricature. The gaslights flicker. The smells overpower. The crowd roars, calling for an encore from a man not quite forty years old yet already mantled with the superlative “originator of the banjo.”1 He obliges, performing the last of many songs inspired by his homeland in the Piedmont of Virginia. As the “Celebrated Virginny Banjo Player” steps off the stage into the wings, a shadowy figure awaits him. The banjoist hands his instrument over to the man who quickly secures it, locking it away in its case, away from prying eyes that might steal the secrets of its manufacture. Indeed, the banjoist has cause to be protective. There has been quite a demanding market for an instrument copied from his very own banjo. This “genius of the banjo” has declared to the troupe of his fellow performers that should one of them be found “having one of the copies of (my) invention—that party should quit or (I) would leave (myself).” 2 This “Paganini” of the banjo, playing 4,000 miles away from his home along the banks of the Appomattox River, is none other than Joel Walker Sweeney. Appomattox Court House National Historical Park is known far and wide as the site of the beginning of the end of the American Civil War. Largely unknown is the fact that within the park is the birth and burial place of Joel Sweeney—the first documented white banjo player. Even among his many musical kith and kin, Joel figures most prominently in the earliest evolution of the American five-string banjo. Numerous legends and more than a little controversy surround the story of Joel Sweeney, while actual records and documentation of his role in the origin of the banjo are harder to come by. Originally credited as the creator of the wood-bodied, five-string banjo, Joel was later relegated to a mere “popularizer” of the instrument. The Sweeney legend has evolved as our knowledge of the banjo’s origins has expanded.3 But within the ever-growing story of cultural diffusion and cross pollination on the fertile, racially complicated grounds of antebellum Appomattox, Virginia, the seminal significance of Joel Sweeney persists. Indeed, Joel Sweeney’s rise to stardom in the popular culture of the nineteenth century is not unlike the story of Elvis Aaron Presley’s rise to rock ’n’ roll fame in the twentieth century. Elvis was another Southern white musician who, like Joel, served as a bridge between African American and European American culture and music. Joel Sweeney was born around 1813, along the headwaters of the Appomattox River in what was then Buckingham County, to a family of relatively modest means. 4 Joel’s father, John, a farmer and wheelwright, owned only two slaves in an area whose population on the eve of the Civil War was more than 50 percent enslaved. 5 Such density and proximity afforded a young Joel Sweeney ample opportunity to sneak out of an evening and listen to the songs of the slaves. 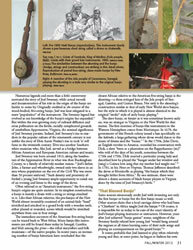 Often referred to as “America’s instrument,” the five-string banjo’s origins are quite ancient. In its simplest construction, a banjo is merely a drum with a string or strings attached to it. Like their African relatives, the pre-banjos of the New World almost invariably consisted of an animal-hide “head” stretched and attached to a gourd body with a wooden neck, either planed or rounded, across which would be stretched anywhere from one to four strings. 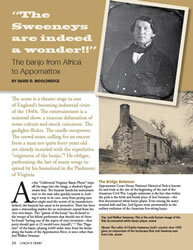 David Delender Wooldridge is a museum technician with Appomattox Court House National Historical Park (ACHNHP). For seventeen years—first in a seasonal capacity and now as a full-time employee—he has worked in the shadow of his great-great-great-grandmother Mariah Wright’s house, preserved as part of the ACHNHP. His great-great-great-uncle joined the Second Virginia Cavalry along with Sam Sweeney and Sweeney’s musical cousin Bob. I vaguely remembered stories my grandmother would tell me when we visited the “surrender grounds”—stories about how her great uncle had been the jailer and her great aunt would have to make enough meals for both her husband and any prisoners at the time. Then one day, as I was scanning one of the park’s old scrapbooks, my great-grandmother appeared staring up at me, out of the pages of history, in an article featuring a picture of her. She was visiting the park in 1965 to make sure they had gotten the reconstruction of the courthouse “right.” She had been on the porch of the Mariah Wright house (her great-grandmother’s home) when she saw the original courthouse burn in 1892. At that moment, it all came together. I felt such an affinity for this place, the stomping grounds of my father’s family. Now I bring my children here and tell them stories of their ancestors. Wooldridge, a former middle and high school social studies teacher, received his undergraduate degree in history and education from Radford University and his master’s degree in education from the Curry School at the University of Virginia. He has played the banjo for over fifteen years. He lives in Lowesville, Virginia, with his wife and children whose, patience, understanding, and devotion made this article possible.